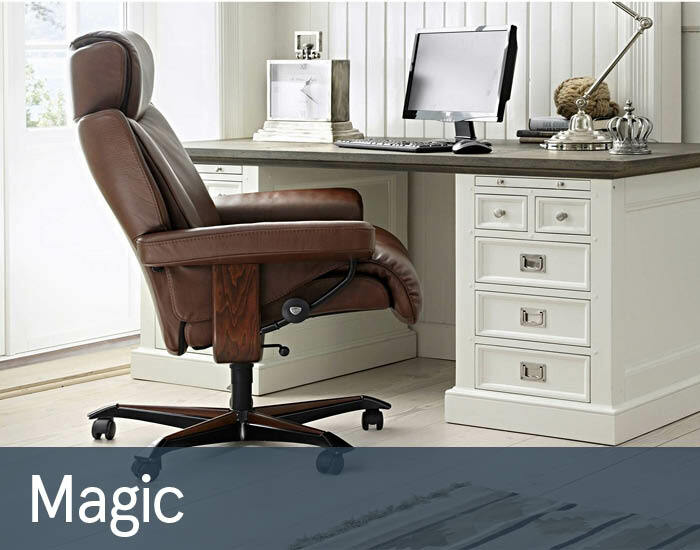 Magic is quite possibly the most comfortable chair that Stressless have ever made. Its unique T-formed cushioning and luxurious soft foam with fibre double-pad topper envelope your body as you sit back, to give your body support in all the right places. Hand-crafted from only the very finest materials with many innovative ergonomic support and relax features this stylish chair and stool will make a welcome addition to any modern living space, satisfying the demands of even the most discerning of people. Magic will perfectly complement Stressless’s timeless Legend collection of luxurious sofas, if you’re looking to furnish a larger space.